In the following charts and images we examine at tiny area of the sky only 30-arc minutes wide to reveal the the Coma Cluster of Galaxies. Using STAR Atlas:PRO™ we demonstrate how every galaxy and Non-Stellar Object (non-star) in the photograph are displayed in correct position and orientation with unprecedented accuracy. This composite image is the result of overlaying a chart from the STAR Atlas:PRO™ with an actual colour image of the Coma Cluster of Galaxies. 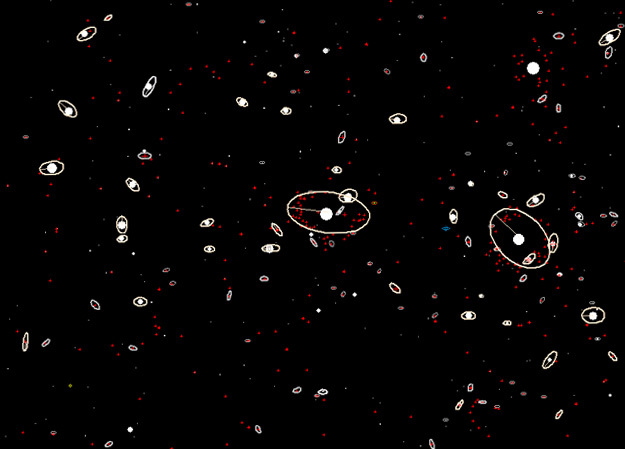 As you can see STAR Atlas:PRO™ plots every galaxy in correct position and orientation. The majority of galaxies are also displayed in their correct effective colour, like the bright bluish galaxy near the top left of image. STAR Atlas:PRO™ also displays valuable data for every object on the chart and fully integrates with features like the Observation List Generator, Observation Planner and Telescope Control features. 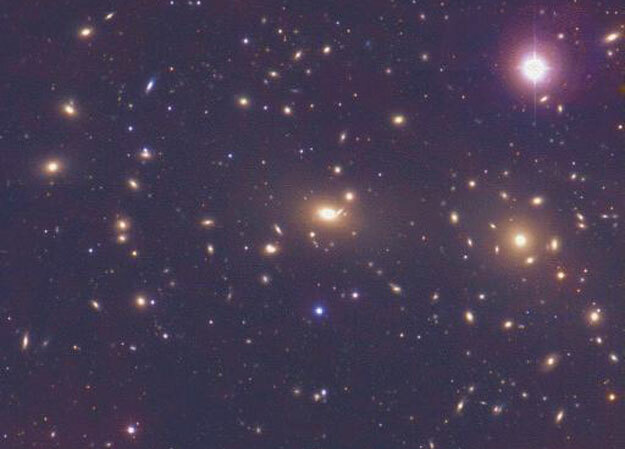 This image is the actual photographic image of the Coma Cluster of Galaxies created by Lopez-Cruz and I. K. Shelton (U. Toronto), Kitt Peak National Obs. This is the chart of the Coma Cluster of Galaxies used to overlay on the photographic image (top). The red-cross symbols distinguish Non-Stellar Objects (non-stars) and are proportional in size to their Magnitude. These objects normally appear on amateur CCD images as small tiny non-star objects. Note: this chart was reduced in size (and clarity) to fit this web page. Example charts of the Coma Cluster following.